please use the Bid form to place your bid OR to Buy Now an item. Refresh page to place another bid. 6 Tickets, up to a $210 Value. Admission: All-Day; Training: Safety & Tactical; Safety Gear: Face & Eye Shield; Paintball Marker: Semi-Automatic Gun. Not included are paintballs and air refills - they must be purchased at the facility per person. Children must be at least 10 years old or older to play paintball. Reservations are recommended and may be required at some locations. 4 Adult Pases (Children age 17 and under are admitted free). One single day admission voucher valid for 2 people. The admission voucher must be redeemed on a public operating day on or before November 30, 2019. ​2 Admission Tickets - Aqua Adventure is a water park located in Central Park in Fremont. ​2 hours of bowling, shoe rental, mac & cheese bites, and chips & salsa for up to 8 guests! Expires 3/1/20. Laser Quest is an immersive experience that you and your friends will enjoy. Game of Laser Quest for 4. Players must be 7 years of age and older. Certificate good for 4 admissions plus skate rentals on any regularly scheduled public skating session. Expires 12/20/19. Four (4) general admission tickets to the California Academy of Sciences. Tickets are valid for one year from the date of your event. Tickets are not valid for refunds or exchanges. Donated tickets are intended to assist with specific fundraising events. California Academy of Sciences’ tickets are not for resale. 2 Passes good for general admission - Valid through March 31, 2020, plus a beautiful zoo bag by Growing Up Arts and Crafts - West Portal - and snacks to take with you​. The lucky winner will help with leading student activities, announcements, lead prayer and pledge, and enjoy a one on one executive lunch with Mrs. Fitzpatrick! Winner will become the Principal for the day on March 25th, 2019. How cool to have your child’s birthday party in the school gym?! Throw some hoops! Perform on the stage! Have some relay races! We provide the space, you bring in your party and food. Arrangement to be made with Gym Director. ​STREET NAME - Want a street named after you for a year? Be the highest bidder and Phil's Alley Lane can be changed to your name or any name of your choice. Street Name will be up for the calendar year 2020. CHRISTMAS SHOW - Reserved Parking (for 1 car) and Reserved Seats for 2! Drive in to your reserved parking space in front of the school and walk in to your special seats for the Christmas Show! EXTRA RECESS TIME FOR A CLASS!!! Let your child be the "Super Cool Kid of the Day"! Your child and his/her classmates will get an additional 20 minutes of recess in the gym with music and snacks! The rest of the school will be back in class while your child's class gets to enjoy this spectacular experience! This will happen before the end of the school year 2018-19. Hosted by TK/K Parents. Have a blast on Friday, April 5, 2019, when Miss Egan and Mrs. Slattery captain kickball teams for an afternoon of fun! Participants will have sporty FREE DRESS that day and receive some yummy treats to give them energy to kick the ball as far as they can. Limit of 20 children (Grades 1-3). All the fun starts at 1 pm! List is updated throughout the day. 4. Gianna Farrugia - 1st. Overnight camping at STM from Friday 5/10/19 - 6pm to Saturday 5/11/19 - 10 am. Includes pasta dinner on Friday and pancake breakfast on Saturday. Board games, music, movie and smores are some of the activities included. | 15-20 children 5th to 8th grade | STM kids only). No electronics allowed | Children may bring cellphones for emergency calls only. NOTE: A minimum of 12 participants needed. Hosted by 1st Grade Parents. Slainte! Enjoy a fun-filled night at The Fitzpatrick's where the bubbly will be flowing! Limited to 30 adults, includes your choice of beverages: cocktails, beer, wine or champagne plus hors d'oeuvres!! The party runs from 6-9pm on Friday, March 29, 2019. ​NOTE: A minimum of 20 participants needed. Adult fun night for you and your friends: Reserved seating for a team of 4-6 people, 2 pints per team member and VIP service from 8th grade teacher and Durty Nelly bartender, Miss Kane! Test your knowlege against a faculty team, captained by Mr. Kavanagh! Arrangements to be made with Miss Kane. Funday Monday! Meet Miss Verzosa and Miss Kane on March 25, 2019 at the Century Movie theaters in Daly City for a fun showing of a popular movie, plus popcorn and snacks. Limit of 10 children. (Grades 4-8). Activity will start between 1pm and 2pm depending on the movie chosen. 10 lucky climbers will meet Mrs. Santillan at Planet Granite (924 Mason Street, SF) for a 2 hours climbing session on Saturday, March 23, 2019. The session will begin at 12:30pm and run until 2:45pm. Includes Shoes and Harness. Limit of 10 children. Open to children aged 10-13. ADULT NIGHT OUT! Have fun cheering on a new female superhero in Captain Marvel at the hip Alamo Drafthouse on Mission St with Mrs. White. Delicious drinks and eats included! Date TBD. Please note that winners must be 21+. Enjoy a fun day out with Mrs. Tyaglo, Miss Balmy and Mrs. Shouldice at the San Francisco Zoo on Saturday, April 6th from 10:30am-1pm. Snacks will be provided. Limit of 12 children. Open to children in grades TK-5th grade. Enjoy a special St. Patrick's Day classroom party on Friday, March 15th, 2019, hosted by Mrs. Kapovich that includes homemade cupcakes, drinks and napkins. Of course Harley will be there too! Roger Timothy Craig is a former American football running back in the National Football League. He played for the San Francisco 49ers, Los Angeles Raiders and Minnesota Vikings. Craig went to four Pro Bowls and won three Super Bowls with the 49ers. Entry into the 2020 Golf Tournament for 4 golfers, which includes a round of golf, cart plus goody bags. Also includes golf mini pen set with putting green, pop up golf chipping net, novelty golf socks and a sleeve of STM golf balls. ​Signed helmet in a case from Eric Reid - American football safety for the Carolina Panthers of the National Football League. Signed football in a case from Joseph Staley - American football offensive tackle for the San Francisco 49ers of the National Football League. He was drafted by the 49ers in the first round of the 2007 NFL Draft. ​Autographed jersey by Antoine Bethea with frame - American football safety for the Arizona Cardinals of the National Football League. He played college football for Howard and was drafted by the Indianapolis Colts in the sixth round of the 2006 NFL Draft. Bethea has also played for the San Francisco 49ers. Stephen Ray Mariucci, nicknamed "Mooch", is an American sportscaster and former football coach who was the head coach of two National Football League teams, the San Francisco 49ers and the Detroit Lions, and for a year at the University of California, Berkeley. New Authentic Coach shoulder bag. Brown/Dark Turquoise. $50 Gift Card plus a beautiful miniature skirt-uniform for a doll! This relaxed day spa offers both familiar & Asian treatments, plus Japanese-style communal baths. Gift Card for a 25 minute massage with spa access. Expires 2.23.20. ​Nu Wave Induction Cooktop with double boiler. Keep your skills fresh with Legarza Basketball Camp! $100 towards ANY camp, league or training. 3 Month household membership to the Stonestown Family YMCA. New members only. Expires 12/31/09. The art of hand embroidery is enjoying an artistic and commercial renaissance throughout the world. Through classes taught by world-class stitchers and textile artists, The San Francisco School of Needlework & Design is bringing a fresh and modern creativity to this ancient art form. ​$150 Class Certificate to any course at SNAD! One month unlimited Hapkido classes, Free Uniform (except BJJ GI), & Free Private Introductory Lesson at Barrios Martial Arts - Potrero Hill. Private yoga class just for you! Certificate good for individual or family yoga with yoga instructor Barbara Velado. Namaste! $100 certificate towards swim lessons at La petite Baleen Swim Schools. One bottle of red wine, one small blanket , 2 Warner mug, 2 ticket to California Academy of Science for the planetarium, night light star projector, 2 movie ticket, 2 ticket to paint the night. Enjoy a grand day in St. Helena at Trinchero Napa Valley with a tour and tasting in their Tasting Room! Weber Jumbo Joe 18 inch Grill, 5 pc Stainless steal BBQ utensil set, small bag of charcoal, Flavor God Seasoning, Kansas City's Cowtown Night of the Living BBQ Sauce, 6 pack of Lagunitas Beer. 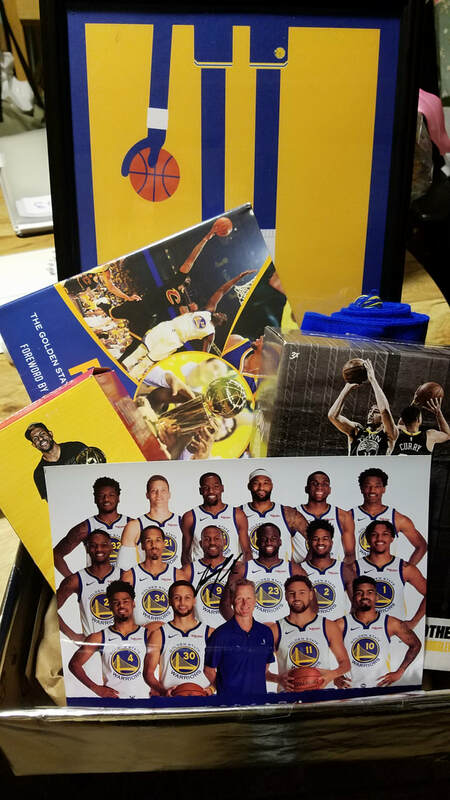 Two tickets (Sec 105/Row 6/Seats 11 & 12) and a parking pass for the March 10th game against the Phoenix Suns, along with a Warriors fleece blanket measuring 50 inches (L) x 60 inches (W). Gift certificates for 4 tickets to a men’s basketball game (excludes premium games). Tickets include 4 Hiltop Club VIP access, 4 hotdogs and 4 sodas from concession, and 4 USF T-shirts! Create your unforgettable family bonding memories for 2019. Make sure to take pictures and live, laugh and love! Included: 4 tickets to Great America, 2 insulated water bottles, 2 Nautica beach towels, 1 travel neck pillow, 1 heart shaped wireless rechargeable speaker, 1 clear travel tote and woden frame. HIGH TEA AT LOVEJOY'S (SF) OR LOVEY'S TEA SHOPPE (PACIFICA) FOR 2! ​Package includes 2 gift certificates for High Tea at Lovejoy’s Tea Room in Noe Valley, SF or at Pacifica location; 2 vintage cups & saucers, large vintage “tea themed” linen cloth, vintage tea bag holder - all of this comes in a white service tray lined with lace and glass insert. $100 Gift Card - Famous quotes cover the walls of this airy restaurant where the rustic Italian menu changes daily. $50 Gift Card - Popular hangout & late-night spot for coffee, juice & a menu of traditional Filipino small plates at two locations! ​$75 Gift Card to Cheesecake Factory - American chain restaurant offering sizable portions from a vast menu including signature cheesecake. Philz coffee, hot chocolate from Ghiradelli, Japanese pancake mix, jam, organic syrup, Wycen Chinese sausage, and a bottle of Perrier Jouet champagne. $100 Gift Card - Intimate trattoria with eclectic art & a changing menu that always includes handmade focaccia; located in North Beach on Columbus Avenue. Donated by Lynnet Spiegel. $100 Gift Card - San Francisco's Contemporary & Traditional Dim Sum; two locations: Rincon Center (Spear at Mission) or 49 Stevenson Street. $100 Gift Card - Cantonese Chinese Cuisine • Specialty Dishes • Dim Sum; located in Diamond Heights neighborhood. ​$100 Gift Card - Devour upscale Cantonese specialties that overlooks Market and Geary at this hip bar and restaurant. $100 Gift Card - Upscale New American eatery with an extensive wine list, banquette seating & Embarcadero views. $100 Gift Card - Trendy Charles Phan eatery serving modern Vietnamese fare in a glass-heavy space with bay views. Located inside the Ferry Building. $100 Gift Card - Dinner-only ristorante serving traditional Italian pasta, fish & meat dishes with wine in the heart of North Beach. ​Enjoy this delectable creation that comes in a large cylindrical container. Enjoy this delectable creation that comes in a large cylindrical container. Enjoy a basket with some of Trader Joe's most popular products and a shopping tote! (Olive oil, pasta sauce, marinated olives, salami stick, organic pasta, bruschetta, organic polenta, etc) . 2 dozen custom decorated cookies from Ashley Wong Sweets, LLC. Poached salmon and prawns, steak with mushrooms, and pasta carbonara are just a few of the main course items you can choose from. Seasonal salads, cheese and fruit platters, smoked salmon with bagels, and assorted homemade pastries & more! Of course, save room for the famous Cliff House popovers, delectable desserts and chocolate-dipped strawberries! Cheers! ​4 course meal plus wine pairing for each course for up to 8 people. DO NOT MISS THIS ONE!!! Beautiful setting in Northbeach for a truly exceptional experience! Valid Sunday - Thursday. 4 course meal plus wine pairing for each course for up to 8 people. DO NOT MISS THIS ONE!! A local favorite eatery to share with special friends for an unforgettable night! Valid Sunday - Thursday. ​Chocolate gooey perfection! Only available at STM!!! Made with love by Sue Kapovich. Say cheese...or pepperoni please!. Host a class pizza party or go out for dinner with family and friends. $150 certificate good for any Round Table Pizza. Treat your class to an ice cream party complete with their favorite flavors and toppings. Anything from vanilla to mint chocolate chip and hot fudge to nuts (no nuts of course if any one is allergic). Don't worry about set up, the utensils or the clean up - the STM 5th grade class will take care of all it. Treats for the whole class! No need to shop, bake or bring anything to the school. On student's birthday, the following will be delivered to school: mini Krispy Kreme donuts or bag of small chips (auction winner's choice), Capri Suns, napkins & "To-go" party favors (personalized faux balloons) on giant Pixy sticks for birthday student & classmates. Auction winner will need to purchase birthday book from school's online link and coordinate date & time with teacher. Minimum 2 week notice. Donated by: 7th Grade Parents. Do you need time to go shopping, go out to dinner or just have a break? Then this offer is for you. 4 hours of babysitting, with pizza and activities for up to 2 children. A mom from 4th Grade will go to the family’s home to watch the kids. Choose a day from Monday to Friday, from 6 pm to 10 pm. ​Donated by: 4th Grade Parents. Waiver needs to be signed by all participants. A DAY OUT WITH THE FAMILY! Enjoy a day at the park playing with these drones: (1) Sharper Image Rechargeable Fly and Drive Car Drone - White, Altitude Propel 2.4GHZ High Performance Drone Wireless Quadrocopter. (2) Altitude Propel 2.4GHZ High Performance Drone PLUS $10 Coldstone gift card, $5 Jamba Juice gift card and $5 Starbucks gift card. Enjoy a beautiful picknic basket with plates, cups and silverware for 4 PLUS a variety of snacks and wine cups. Perfect for a sunny day at the park! “Miracle Rosie and Rags", a Special Edition set of dolls from Marie Osmond’s injured "Miracle Children" series. Certificate of authenticity included. ​The winner must have an account with Choicelunch in order to use the credit. If they do not have an account, one can easily be made by going to the Choicelunch website. The credit is not redeemable for cash. ​Gifts for manly men: A bottle of El Padrino Tequila, 2 Macanudo Cafe Hampton Court Cigars, Men's Yves Saint Laurent La Nuit de L'Homme Eau de Toilette, 2 oz. and 2 movie tickets. Tax deduction is limited to the excess of the contribution over the fair market value of any items received in exchange for the donation.